If Thanksgiving is the big holiday of the season for eating, then what is the big holiday of the season for shopper? Black Friday of course! Black Friday, the Friday after Thanksgiving, is the unofficial start of the Christmas shopping season. On that day, stores begin all of their Black Friday sales, many of which start at the wee hours of the morning. Real bargain hunters know that this is the prime time to score deals on Christmas gifts. If you are one of those shoppers who seek out Black Friday sales, then you know how critical it is to be awake and energized for a day of frenetic shopping. To help you on your quest, here is the definitive list of 24 Healthy Make Ahead Snacks for Black Friday Sales. Make these healthy snacks recipes the night before, and be sure to stash them with you before you head out in the morning. Anytime during your excursion you feel hungry and sluggish, you will be happy to know that you have low calorie snacks on hand to keep you going all day long! 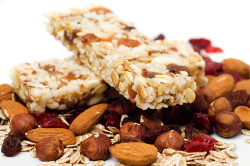 Store bought granola bars may seem healthy, but usually they are loaded with sugar and calories. Instead, elect to make a healthier version at home. Sometimes, you just cannot resist the calling of your sweet tooth. At least with these easy snacks, you know exactly what you are consuming. These healthy snack recipes are just what you will need if you plan on being out and about for a long time. Of course, not everything on your list of snacks to take needs to be a recipe. Whole fruit, especially apples and bananas, are portable and provide a great natural source iof sugar and fiber to keep you going. Additionally, unsalted nuts in moderation will fill you up and give you an added boost of protein. If you can, try to avoid the temptation of processed snacks. More often than not, even those quick snacks that look innocent enough are loaded with sugar and sodium. As always, when it comes to snack ideas, homemade is always preferred.